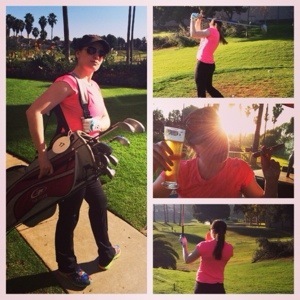 So… it turns out I love to golf. I learned this yesterday. It was very exciting then. It’s still very exciting now. Even just thinking about the next time I can get out on a course is very exciting to me. And I’m shocked. Because it’s golf. GOLF. It’s a sport that I have a stand up bit making fun of. I would shake my head when people told me they liked it. I didn’t ever understand why people would watch it. And- to be honest- until yesterday, I wouldn’t have even called it a sport. Yes! I was mean to golf! You’re daggum right I was! I’m not proud of it! I’m trying to set the record straight! It turns out, it takes a lot of patience, finesse and athleticism to golf. Sure, it’s not the best cardio workout on the planet. You’re not going to shred pounds while golfing. But you are going to connect with your mind and body. And golf etiquette is going to keep you off your phone (for the most part), so you’ll unplug for a couple hours from the rest of the world. And golf courses are super scenic and pretty, so you can be outside in nature for a while. And other golfers are polite. And it’s quiet. It’s… awesome. And I did have fun. Even though I hit several balls into a lake and nearly hit an innocent person sitting on a bench on a different hole because I swung way too hard and didn’t get anywhere near my own hole. It was fun the whole time. I can’t wait to get back out there. 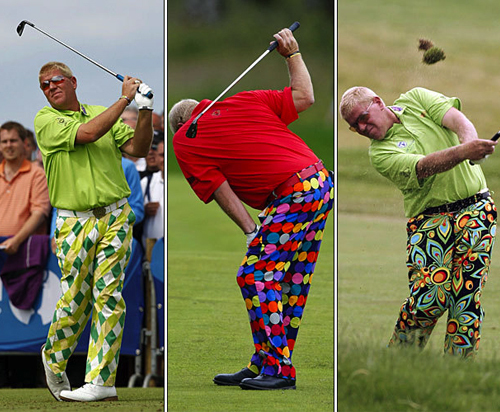 Especially since golf outfits are friggin’ amazing. And given my own outlandish and eclectic taste, I finally have a place where I can wear whatever I want and not get judged for it. I know he’s probably someone very famous in golf (because he came up a bunch on my google searches). But I didn’t take the time to do my research on it yet. I just started yesterday, you guys. Gimme a little break. I can’t wait to get out there again. I was getting better every hole with every stroke. I started understanding strategy and the benefit of the different clubs. I still don’t completely get it by any means- but that just comes with time and practice. Not to mention, afterwards you can totally splurge on beer and cigars. If that’s your style. At least it makes you look badass in pictures.